Special thanks to Eat Fit for extending this food review invitation. People are getting more health-conscious nowadays, but often do not have time to cook their own meals. Operating from its kitchen in Chai Leng Park, Eat Fit fills this expanding niche. This food delivery service designs a menu around healthy and balanced diet. Food pricing is affordable in order to appeal to the mainstream market. One does not need to be a nutritionist to make a purchase. Customers can visit Eat Fit's website to view the caloric and nutritional information of each dish, and then place their orders on the spot. 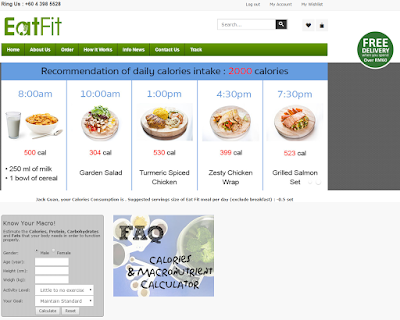 To allow customers to make informed choices, the website also includes a calories and macronutrients calculator. This tool is developed based on the Harris-Benedict equation. 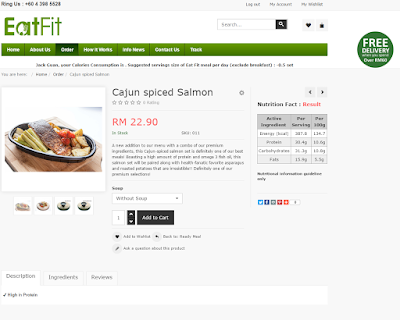 One of my favorite dishes at Eat Fit is Cajun Spiced Salmon (RM22.90). Grilled salmon fillet is seasoned with Cajun spices and served with roasted potatoes, asparagus and cherry tomatoes. Salmon is a healthy choice of fish because it is rich in protein and omega-3 fatty acids. Trick Or Cheat Set (RM12.90) is a clever wordplay on "trick-or-treat". The main component is breaded chicken breast, which is seasoned with Cayenne pepper, paprika and other spices. Served on the side is penne pasta in fresh tomato sauce. In line with its Halloween reference, roasted pumpkins are included too. 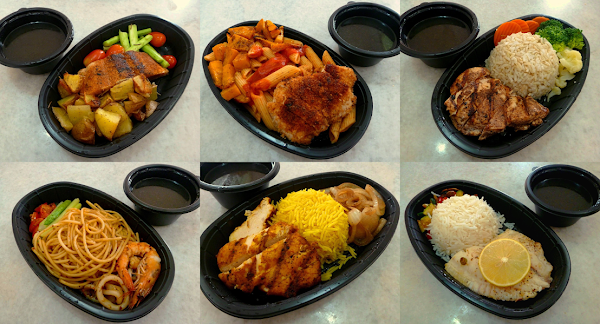 Lemon Herb Chicken Set (RM8.90) features a piece of chicken breast that is flavored with lemon, cinnamon and pepper. Olive oil is used to grill the cutlet. Accompanying vegetables are broccoli, cauliflower and carrots. This dish comes with brown rice, which compared to white rice, is higher in vitamins, mineral and dietary fiber. As for poultry with spicier seasoning, Turmeric Spiced Chicken (RM9.90) is also available. The chicken cutlet is lightly grilled on both sides. Instead the usual jasmine rice, long-grain basmati rice is used. The rice appears yellow due to the presence of turmeric (kunyit). This dish is served with grilled onions on the side. Lemon Garlic Tilapia Fillet (RM15.90) is ideal for people with milder palate. Premium-quality tilapia fillet is solely seasoned with lemon and garlic in order to preserve the fish's original flavor. On the side are sautéed vegetables such as zucchini, red capsicum and portobello (button) mushrooms. This dish comes with white basmati rice. Moving on to Grilled Seafood Set (RM17.90), this is a pasta dish with grilled shrimps and squid. The spaghetti is on the drier side of things, but this is probably intentional in order to reduce its caloric content. Cherry tomatoes and asparagus serve as counterbalance to the overall taste. Currently, Eat Fit offers 2 types of soup to go with each main dish: Clear Onion Soup (RM1.50) and Creamless Mushroom Soup (RM2.00). The latter is served today. Creamy mushroom soup is not used due to high amount of fat. Eat Fit provides doorstep delivery to any address in the state of Penang. Delivery charge is RM10.00 within Penang Island. For Seberang Jaya, the fee varies between RM2.00 and RM10.00 depending on locality. Delivery charge is waived for orders worth RM60.00 or more. Customers can select any 1-hour delivery window when placing their orders. Eat Fit operates every day except Sundays. To allow enough time for the kitchen to prepare, 1-day advance ordering is required. As for payment, customers can opt for cash on delivery, or pay using a credit/debit card (RM2.00 surcharge applies).